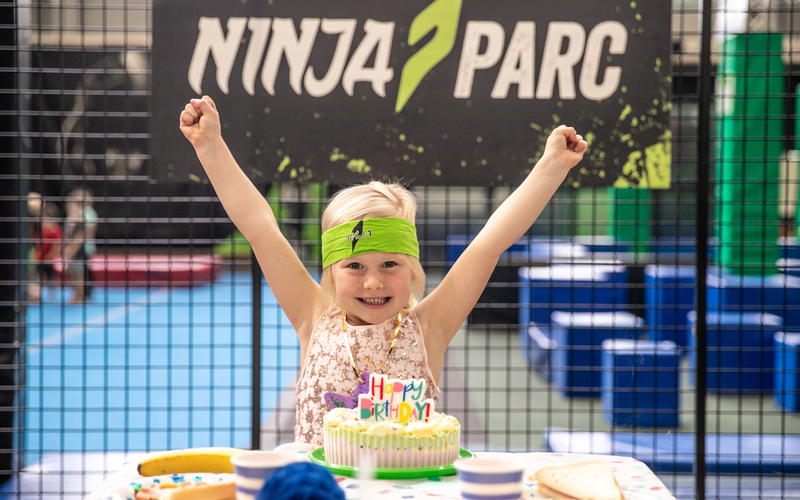 Ninja Parc parties are designed to not only deliver on fun but to also encourage kids to get moving in a group environment. Available for groups of 10 or more, Kids Parties include two hours of action-packed fun in either Ninja, Climb or Sports Parc. Food, water, cordial, an ice cream cake and your very own Party Coordinator and table are also included. A downloadable invitation is available in Purple - Cooks Hill Party Invite and Black - Cooks Hill Party Invite. Ready to host a birthday party with a difference? Follow these three steps. Parties are available in either Ninja, Climb or Sports Parc. Please select one. NINJA PARTY For eight years and older, our Ninja Party is $29.95 per head and includes access to Ninja Parc and its obstacle courses. SPORTS PARTY For six years and older, our Sports Party is $24.95 per head and includes three sports: choose from netball, soccer, cricket, basketball, floorball, dodge ball and t-ball. Each Parc Party includes one food option. Please select your choice. A mix of cheese, ham and cheese, Hawaiian and Meat Lovers is included with gluten free options available. The Café option includes two foods: choose from sandwiches, wraps and hotdogs. Gluten free options are also available. The best of both worlds. This option includes pizza and one café option, with gluten free options available.